You promised your Lord to build a church alone without a nail. But envious people are trying to avoid fulfilling your plan. Complete construction while defending the Transfiguration church from bandits. 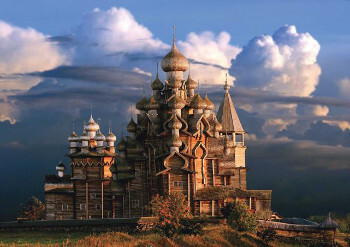 Kizhi Pogost is GranCalabaza's entry to the 2016 Defend the Spot Competition. The scenario is essentially a tower defense map where you try to build a wonder and defend it. However, this is made incredibly tedious as the player has control of only one villager, which takes excessively long to build a wonder. There were only a couple noticeable bugs - one was that sometimes the AI would not attack once the player entered the ruin and activated it, and the other was that the AI seemed to cause a large amount of lag. Aside from the aforementioned bug where the AI doesn't attack, the scenario does little more than throw endless waves of weak enemies at the player's base, which culminates in more of an annoyance than an actual threat. Between wall abuse and spamming towers the player has little difficulty in holding off the endless waves while waiting for their wonder victory. There were a few creative elements involved, such as the disabling of certain buildings and techs designed to allow the player to level up periodically as they were advanced in age and tributed certain resources, but aside from that there were few noticeably novel elements. The map was a largely flat and homogenous mix of grass 1, snow grass, and snow pine forest. The exception was the center region, which exhibited slightly more variety and included some elevation. While not unsightly, the map design could go to see a good deal of improvement. For a fairly simple scenario, detailed instructions are often not necessary, and that was the case here. Nevertheless, the scenario was devoid of any substantial background or story, detracting from the score here.